Over 200 individuals are members of the Highfields Community Association along with affiliated member groups. Every member is encouraged to volunteer, join the association’s governing body or a committee. The centre picks up elderly residents on a weekly basis and brings them to the centre to socialise and participate in art and exercise activities, reducing social isolation. The centre runs a job club, giving unemployed members of the community a chance to search for jobs in a supportive environment. With limited access to computers/ internet at home, members rely on job club to find employment and training. Opened in 1974,Highfields Centre has been the cornerstone of the local community in Highfields, Leicester. The centre is located in a richly diverse area of Leicester; behind them is a large public housing estate and only two miles away is Narborough Road, frequently referred to as ‘the most diverse road in Britain’. The centre is an invaluable resource to all members of the community, and since its independence from the local authority in 2010 it has served over 500,000 users. 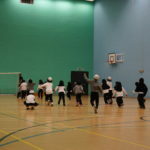 In a half mile radius alone, there are a total of 9 state primary schools, making the centre’s space even more important for local young people. Highfields Centre has seen generations come through its doors, and in some cases it has had such an impact on some young volunteers that they have become staff. Open seven days a week for 322 days a year (plus additional days by arrangement), the centre offers everything from sports programmes for local schools and elders groups, music and media facilities, ESOL classes and other adult education classes, a nursery, youth work sessions, a fashion suite, a prayer room, community spaces, sports hall and a gym with first-rate facilities. Highfields Community Association is the voluntary body responsible for the management and oversight of Highfields Centre. It was set up in 1972 as a registered charity to oversee the development of the old Highfields Youth and Community Centre. In 2004, the centre underwent a near £5 million refurbishment to provide more services, including a nursery and a youth provision. It was a difficult time as the community and council had different visions for the building, but they got through it. Highfields Community Association then adopted a new management system to include representatives of user groups of the centre as well as other interested parties. And had the responsibility for planning the delivery, staffing and quality of services. After years of struggling with the Council’s changing funding and community priorities, in 2010 Highfields Centre achieved community governance through an asset transfer from Leicester City Council. This was a huge milestone for the centre, and a testament to all the staff, volunteers and centre users who had backed the campaign for independence. Now the Centre is managed by an annually elected governing body composed of individuals from affiliated member groups. They meet bi-monthly to discuss issues and plan out the centre’s programmes. Local community members are often consulted in the decision making process in order to ensure that the centre is successfully serving the community. Highfields Centre is located in a diverse and transient part of Leicester with 85% of residents from BAME (Black, Asian, and Minority Ethnic) groups. Originally the community had large Irish, African Caribbean and South Asian populations but has since expanded to include more groups from the Indian sub-continent, Eastern Europe and parts of Africa and the Middle East. Since the 1990s the Somali population has rapidly increased in large part to the ongoing civil war. No matter an individual’s ethnicity, Highfields Centre is open to all and offers programmes that cater to the area’s diverse population. The Highfields area is faced with high unemployment, over-crowding, and poor life expectancy. Over 25% of the population are on benefits, 8.2% claim job seeker benefits which is very high compared to the national averages of 15% and 3.5% respectively. Highfields Centre offers a valuable resource to these people by proving job search support and qualification courses to improve employment prospects. Furthermore, life expectancy in the area is lower and chronic diseases are much higher than all other areas of Leicester. This is all made worse by poor housing conditions and overcrowding. 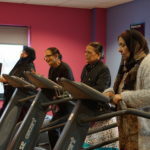 Highfields Centre provides an escape and gives residents a place to improve their health in the fitness and sports facilities as well as through social programmes.